Some wonder if our talk about God, Father, Son and Holy Spirit; about the story of Pentecost which we celebrate today, means anything at all. Is it just an old tale that has nothing to do with life and life’s challenges today? Let’s look at this great story told in our first reading. (Acts 2,1-22) The Spirit of God came down on some people in Jerusalem over two thousand years ago, our story says. Who were these people? Those mentioned first were disciples of Jesus gathered together in one place, as we are today. They had previously seen Jesus die and then they saw him risen from the dead. They were gathered in Jerusalem on the Jewish feast of Pentecost, when the Jews celebrated the blessings of the harvest that gave them food for life and the words of God that guided them. On this feast of Pentecost a new blessing of life would be given, a blessing from Jesus, risen from the dead. A fierce wind shook the house, tongues of fire fell on them– symbols of light and power–and those in the house were filled with new hopes, new dreams, new thoughts, new energy, new words. The Spirit of God was given to them. But notice that the Spirit of God is given to others as well, not only to those in the house, but those outside. There were visitors from all parts of the world in Jerusalem for the feast and they experienced this blessing too. When they ask Peter what’s happening, he says the Spirit of God is being poured out on all flesh, “and your sons and your daughters will prophesy, and your young men will see visions and your old men will dream dreams.” (Acts 2.17-18) Even your slaves, the poorest among you, will be blessed by God’s Spirit, Peter says, quoting from the Prophet Joel. Christians can easily become too parochial, as if God were our private God, given only to us. But the Feast of Pentecost reminds us that God reaches with divine blessings to the ends of the earth. The Spirit has been poured out on “all flesh,” on all our world. Strong winds and tongues of fire may not be the signs of his presence everywhere, but the Spirit of God dwells in our world all the same, blessing it with power and truth. On this feast God opens the horizons of our minds to a greater world where God’s Spirit is at work. This entry was posted in Religion and tagged all flesh, blessings for the world, Church, Holy Spirit, Passionists, Pentecost, tongues of fire on May 30, 2009 by vhoagland. Many of the gospels readings read at Mass in the Easter season come from the gospel of John, and often enough from the long discourse at the Last Supper found in chapters 13-17. Today’s gospel, from John 15,9-17, is one of them. Jesus tells his disciples of his love for them and urges them to love one another. A simple message, it seems, spoken long ago. If we listen the group of scholars who make up The Jesus Seminar these are not just words from long ago, but Jesus never said them. They were made up by Christians later on. The scholars and others who make up The Jesus Seminar, a group founded in 1985 by the late Robert Funk and John Dominic Crossan, are interested in the historical Jesus. They want to know what he really said and did, and so they meet about twice a year and try to decide what we know for sure. The seminar people assume that the gospels, written forty, fifty, sixty years after the death of Jesus. are not simply historical accounts, but that religious and ideological motives are also behind their composition. True enough. They have an interesting way of deciding what Jesus really said and did and what he didn’t. They vote on it. After discussing a particular section of the gospels, its members vote with color-coded beads. Red: that’s Jesus; pink: sounds pretty much like him; gray: well, maybe; black, no, that’s not him. As the scholars get tougher with their criterion, what Jesus really said and did becomes more and more reduced. Today’s gospel would probably get a black vote, I think. In general, the Jesus Seminar tends to dismiss John’s gospel as an historical source. But does historical study determine everything? Though much of what The Jesus Seminar says may be true, I think they limit our understanding of Jesus and the scriptures. They do it by discounting his resurrection and his risen life. For example, they may state that the community from which John’s gospel emerged made up many of his words or actions. But we can also say that they experienced the Risen Jesus, who promised to remain always with his own who were in the world? The Risen Lord spoke to them and they recorded his words in a way that was congruent to what he did and said in his earthly life. The Risen Christ abides with his church. His appearances to his disciples after his resurrection would go on in other forms. For those who believe in his risen, abiding presence, Jesus’ voice is not silenced nor are his deeds done at his death. He remains with us and speaks now. This is especially so when we come together for the breaking of the bread and for prayers. The lengthy supper discourse from John seems to verify that. This entry was posted in Religion and tagged Easter readings, Jesus Seminar, John's gospel, Passionists, Risen Christ on May 17, 2009 by vhoagland. 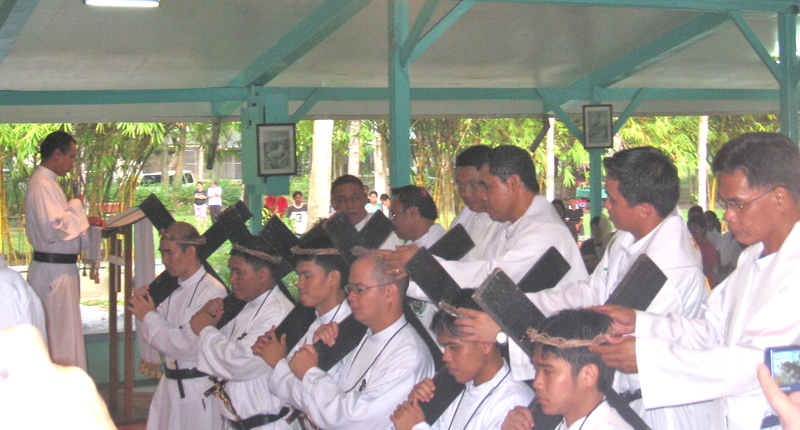 On May 2, 2009, Father Vincent Lai, a priest from China, took his vows and was received into the Passionist Community in the Philippine Islands, along with five other young Filipinos. The Passionists recently celebrated their 50th anniversary in the Philippines; the community was founded then by American Passionists, mostly missionaries who had been expelled from China following the Communist takeover in 1949. I met Father Vincent while visiting the Philippines for the Passionist celebration last November. If there is rejoicing in heaven over what takes place here on earth–and I think there is–those missionaries to China have to be rejoicing at this occasion, when a priest from China becomes a Passionist. In the 1950’s all their work seemed to be destroyed and their good works forgotten. But God has a long hand and does not forget. Father Vincent, we wish you God’s blessings for the ministry that awaits you. 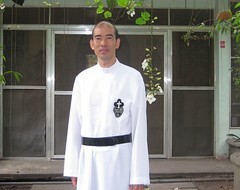 This entry was posted in Religion and tagged China, Passionists, Philippines, vows on May 7, 2009 by vhoagland. It’s recent survey (April 27, 2009) reveals that about half of American adults have changed religious affiliation at least once in their lives and explores the reasons different groups cite for leaving or joining their religion. “Most people who change their religion leave their childhood faith before age 24, and many of those who change religion do so more than once,” the survey says. A sobering survey, indeed. Worth study. What does it call us to do? This entry was posted in Religion and tagged Catholicism, Passionists, Pew Survey, Protestant., religious practice, unaffliated on May 6, 2009 by vhoagland.